Objectives: In the present investigation, the effect of a calpain inhibitor, AK 295, on ischemia/ reperfusion damage in rat kidney were investigated and evaluated. Materials and Methods: 28 male Wistar Albino rats were separated into 4 main random groups (n=7), named group I (control), group II (ischemia-reperfusion), group III (AK295+ischemia-reperfusion) and group IV (DMSO+ischemia-reperfusion). Right kidney nephrectomy under anesthesia of xylazine (5 mg/kg) and ketamine (75 mg/kg) was performed to the rats except for group I. The rats under reversible general anesthesia underwent 30 min total ischemia and then, blood samples (5 cc) and kidney tissues were taken from all the groups rapidly. Caspase 3 enzyme activity was detected in the kidney tissues by Western-blot technique. Serum creatinine and urea values, amount of kidney malondialdehyde, and differences in the cellular antioxidant enzymes superoxide dismutase and catalase were also analyzed. Results: In AK295+IR group, caspase-3 enzyme band was not observed due to the fact that the calpain inhibitor AK295 prevented the ischemic damage. On the other hand, in DMSO+IR group, significant bands appeared due to apoptosis. It was also found that catalase levels in AK295+I/R and DMSO+I/R groups increased insignificantly compared to I/R group (p<0.05). Conclusions: As a result of the study, AK295 could provide further knowledge on ischemia-reperfusion damage that has no current treatment and it could have a place in ischemia-reperfusion damage treatment protocol. One of the major problem about the urological operations is a renal Ischemia-Reperfusion (I/R) injury, some of which are operational revascularization of the renal artery, partial nephrectomy and renal transplantation [1,2]. It is clinically important injury because it causes renal failure and high mortality. The occluded vessel, which provides oxygen to kidney, drops the renal blood flow inside the kidney in ischemia. An aggravate cell damage has been also reported depending on reperfusion . In addition, the mechanisms of inflammation related with the reperfusion damage are so complicated and they include both types of cell death-necrotic and apoptotic. After I/R injury, several apoptotic pathways centrally play a significant role in mediating cell death. At the beginning of phases of the I/R insult, the mitochondria performs the essential role in both apoptosis and necrosis pathways [4,5]. Caspase-3 activity has been found to increase after I/R injury, suggesting that a fas-r mitochondrial mediated pathway might initiate apoptosis . The calpain family includes a heterogeneous group of cysteine proteases with a broad expression pattern that includes multiple isoforms, which are both ubiquitous and tissue specific. Calpains are involved in a variety of calcium-regulated cellular processes such as signal transduction, cell proliferation and differentiation, apoptosis, membrane fusion and platelet activation. This wide variety of physiological functions, including calpains, designates their important pathological role in a host of human diseases. Deregulation of their activity has been involved in neurological disorders, ischemic and traumatic brain injury, cancer, muscular dystrophy, cataracts, strokes and diabetes . The upregulation of various members of the calpain family includes a diverse range of biological processes and diseases that is the reason why this family of proteases has important therapeutic potential. In this area, Several and important researches have been done to improve a means of identifying selective calpain inhibitors, since many of them also inhibit other cysteine proteases, serine proteases and even the proteasome. Synthetic calpain inhibitors include two main groups, which are peptidic and non-peptidic inhibitors. Peptidyl ketoamides are third generation calpain inhibitors developed to improve potency, cell permeability and selectivity; morpholine derivates (i.e. AK275, AK295), enzodioxothianzines (derived from SJA-6017) and chromones are highly specific for calpains compared with other cysteine proteases . AK295, considering to be an anti-apoptotic agent that counteracts the effects of calpains, has been reported to have a role in the treatment of a variety of pathologic central nervous system (CNS) conditions (including trauma and brain ischemia) including in an experimental setting. AK295 is a keto amid calpain inhibitor that is a stronger as comparing to commonly used inhibitors such as leupeptin or calpain inhibitor I . Çolak et al. showed that AK 295 provided significant neuroprotection of brain tissue and attenuated motor and cognitive deficits . In order to prevent ischemic apoptotic death in several cell types such as the heart, brain, liver and renal cells, calpain inhibitors can be used since their usage reduces the extent of the lesions and improve the recovery of normal tissue functions . 28 male Wistar rats (weight approximately 250-300 g) were used throughout the study. The rats were obtained from Experimental Animals Production Center at Inonu University, Malatya, Turkey. During the experimental period, all animals were provided with tap water and Standard rat pellet food ad libitum. 28 animals were randomly divided into four groups: Group I: Sham-operated (n=7) animals that underwent only right nephrectomy, but the left renal pedicle was not occluded. Group II: Renal I/R (n=7). Group III: Renal I/R with 2 mg/kg AK295 administration 30 min. before ischemia (I/R+AK295) (n=7), and Group IV: Renal I/R with 2 mg/kg DMSO administration before ischemia. AK295 (Calbiochem GmBH; Med-Lab, Istanbul, Turkey) was dissolved in DMSO. All experimental procedures conformed to National Research Council guidelines for the handling and care of laboratory animals . Moreover, all experimental procedures and protocols used in this research were reviewed and approved by Inonu University Animal Research Committee. Anesthesia was induced by intramuscular administration of 75 mg/kg ketamine hydrochloride (Ketalar, Parke-Davis, Eczac?ba? ?, and Istanbul, Turkey) and 5 mg/kg xylazine (Rompun, Bayer, Istanbul, Turkey) before the operation: Right nephrectomy was performed through dorsolateral incisions in all rats. I/R were induced by the occlusion of the left renal vessels for 30 min, followed by 24 h reperfusion. Shamoperated animals underwent right nephrectomy only; the left renal pedicle was not occluded. At the end of each in vivo study, the rats were killed and the kidneys were quickly removed. The kidney was placed in liquid nitrogen and stored at -70°C until the section was assayed for biochemical evaluation. Tissues were homogenized (PCV Kinematica Status Homogenizator) in ice-cold phosphate-buffered saline (pH 7.4). The homogenate was sonicated with an ultrasonifier (Bronson Sonifier 450) with three cycles (20 s sonication and 40 s pause on ice). The homogenate was centrifuged (15,000 × g, 10 min, 40°C), and cell-free supernatant was immediately subjected to the enzyme assay. Malondialdehyde (MDA) level analysis was performed as described with a minor modification. The reaction mixture was prepared by adding 250 microliter homogenate into 2 mL reaction solution (15% trichloroacetic acid: 0.375% thiobarbituric acid: 0.25 N HCl 1:1:1. w/v) and heated at 1000°C for 15 min. The mixture was cooled down to room temperature, centrifuged (10,000 × g for 10 min), and the absorbance of the supernatant was recorded at 532 nm. 1, 1, 3, 3-Tetramethoxypropane was used as MDA standard . The values were expressed as nmol/gram wet tissue (g.w.t) in the homogenate. CAT activity was measured at 37°C by following the rate of disappearance of hydrogen peroxide (H2O2) at 240 nm (ε240=40 mM-1cm-1) . One unit of catalase activity is defined as the amount of enzyme catalyzing the degradation of 1 μmol of H2O2 per min at 37°C and specific activity corresponding to transformation of substrate (in μmol) (H2O2) per min per mg protein. SOD (Cu, Zn-SOD) activity in the supernatant fraction was measured using xanthine oxidase/ cytochrome c method where 1 unit (U) of activity is the amount of enzyme needed to cause half-maximal inhibition of cytochrome c reduction. The amount of SOD in the extract was determined as U of enzyme mg-1 protein, utilizing a commercial SOD as the standard . All data are expressed as means ± standard deviation (SD). Statistical analyses were performed SPSS for Windows version 17.0 program. One-way analysis of variance (ANOVA), followed by the Tukey’s test, were applied to calculate the statistical significance between different groups; the level of significance was set at p<0.05. The existence of caspase-3 enzyme in the SDS-page conducted gel was determined by observation of the occurring bands using Western-Blot procedure and caspase-3-specific anti bodies. As could be observed in Figure 1, since there was no damage in the control group (line 2), there was no band observed in the region corresponding to 17 kDa in the determiner standard for caspase-3 enzyme. On the other hand, significant bands were observed in the kidney ischemia group (line 3-4). These bands demonstrate the existence of caspase-3 enzyme and thus, the apoptosis. In AK295+IR group (line 5), no band was observed due to the fact that the calpain inhibitor AK295 prevented the ischemic damage. On the other hand, in DMSO+IR group (line 7-8); significant bands appeared due to apoptosis. 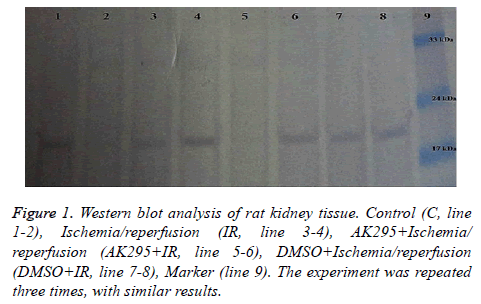 Figure 1: Western blot analysis of rat kidney tissue. Control (C, line 1-2), Ischemia/reperfusion (IR, line 3-4), AK295+Ischemia/ reperfusion (AK295+IR, line 5-6), DMSO+Ischemia/reperfusion (DMSO+IR, line 7-8), Marker (line 9). The experiment was repeated three times, with similar results. Average kidney SOD enzyme activities were calculated as 25 ± 2.61 U/mg protein in control group, 28 ± 6.01 U/mg protein in I/R group, 163 ± 11.43 U/mg protein in AK295+I/R group, and as 149 ± 10.58 U/mg protein in DMSO+I/R group. No significant differences were found between control group and other groups based on SOD enzyme activity (Figure 2). 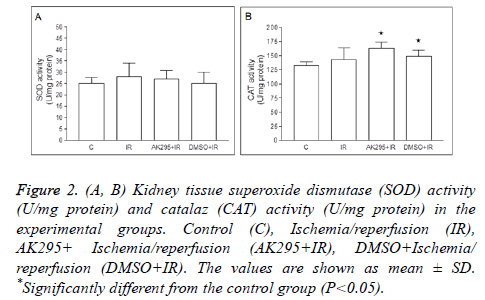 Figure 2: (A, B) Kidney tissue superoxide dismutase (SOD) activity (U/mg protein) and catalaz (CAT) activity (U/mg protein) in the experimental groups. Control (C), Ischemia/reperfusion (IR), AK295+ Ischemia/reperfusion (AK295+IR), DMSO+Ischemia/ reperfusion (DMSO+IR). The values are shown as mean ± SD. *Significantly different from the control group (P<0.05). Average catalase enzyme activities were calculated as 132 ± 6.82 U/mg protein in control group, 143 ± 20.83 U/mg protein in I/R group, 163 ± 11.43 U/mg protein in AK295+I/R group, and as 149 ± 10.58 U/mg protein in DMSO+I/R group. The AK295+I/R and DMSO+I/R values were found to be significantly higher when compared to the control group (p<0.05). The differences between me/R, and AK295+me/R and DMSO+me/R values were not significant (Figure 3). Figure 3: Kidney tissue malondialdehyde (MDA) level (nmol/gwt) in the experimental groups. Control (C), Ischemia/reperfusion (IR), AK295+Ischemia/reperfusion (AK295+IR), DMSO+Ischemia/ reperfusion (DMSO+IR), gram wet tissue (gwt). The values are shown as mean ± SD. *Significantly different from the control group (P<0.05). Average kidney MDA enzyme activities were calculated as 0.24 ± 0.03 nmol/gwt in control group, 0.42 ± 0.15 nmol/gwt in I/R group, 0.38 ± 0.03 nmol/gwt in AK295+I/R group, and 0.48 ± 0.12 nmol/gwt in DMSO+I/R group. It was determined that I/R, AK295+I/R and DMSO+I/R values were significantly higher than that of the control group (p<0.05). Biochemical assets demonstrated that mean urea values were 35 ± 22.3 mg/dL in control group, 156 ± 9.01 mg/dL in I/R group, 151 ± 5.8 mg/dL in AK295+I/R group, and 165 ± 6.1 mg/dL in DMSO+I/R group. It was determined that I/R, AK295+I/R and DMSO+I/R values were significantly higher than that of the control group (p<0.05). Average creatinine values were found as 0.64 ± 0.09 mg/dL in control group, 3.6 ± 0.23 mg/dL in I/R group, 3.76 ± 0.13 mg/dL in AK295+I/R group, and 3.4 ± 0.28 mg/dL in DMSO+I/R group. It was determined that I/R, AK295+I/R and DMSO+I/R values were significantly higher than that of the control group (p<0.05). The differences between I/R, AK295+I/R and DMSO+I/R groups were not significant (Table 1). The values are shown as mean ± SD. *Significantly different from the control group (P<0.05); #Significantly different from the AK295+IR group (P<0.05). Table 1. Serum levels of blood urea nitrogen (BUN) and creatinine in the experimental groups. Control (C), Ischemia/reperfusion (IR), AK295+Ischemia/reperfusion (AK295+IR), DMSO+Ischemia/ reperfusion (DMSO+IR). Ischemia is inadequate level of blood supply into an organ, or the interruption of this blood supply. On the other hand, reperfusion is disabling the factor that causes ischemia and reinstating the tissue blood supply . During renal ischemia reperfusion damage, the blood supply to kidney cortex and medulla is interrupted during ischemia and blood build up occurs in the tissue following the reperfusion. However, during reperfusion, blood build up does not occur evenly in every kidney region, in certain parts, continuing hypoxia is observed, while in others, extreme reperfusion induced edema could develop . Post-hypoxia intracellular mechanisms could result in different local or systemic responses in the cells. Apoptosis is a genetically controlled mechanism that is no longer needed in advanced organisms and enables destruction of cells with function disorders before they harm their environment. In short, apoptosis is the programmed death of cells by genes stimulated in different ways. In this mechanism, different genes such as BCL, BAX are activated. Caspases play a significant role in apoptosis. Caspase, which is a cysteine protease, is activated as a result of stimulation of apoptosis through internal or external signals (DNA damage, UV, etc.) and push the cell towards a point of no return. In this process, the caspases activate each other, causing a proteolytic cascade (cascade type reaction series) . During apoptosis, major determinant factor in cytoplasm is caspase activation. Following caspase activation, structural proteins (actin, fodrin, lamin A-B, etc.) are destroyed. Much like clippers, caspases destroy and render structure proteins and enzymes in the nucleus in the cell ineffective. Due to caspases, initially the relations of cells with their environment are cut off and then they reorganize the cellular skeleton. At the end, they finalize DNA replication and repair . Calpains are calcium dependent neutral proteases found in MSS cytosol and responsible from apoptosis similar to caspases. Calpains are calcium dependent intracellular proteases without lysosomes. They trigger mitochondria mediating procaspase-9 release, while at the same time cause an increase in caspase-3, which is the last active mediator of caspase cascade. Thus, calpains gain a very important role in apoptosis mechanism [19,20]. Calpain inhibitors have decreased proteolysis and cellular death in several cerebral ischemia and brain trauma models [9,21]. The present study was conducted with male Wistar albino rats that were exposed to 30 min of ischemia, followed by 24 h of reperfusion. AK295 was used as calpain inhibitor. Western blot method was used to determine caspase-3, which is an apoptosis indicator. Reperfusion damage was assessed with MDA concentration that reflects the degree of lipid peroxidation, which is the final product of lipid peroxidation together with antioxidant enzymes SOD and catalase. Kidney damage was assessed by serum urea and creatinine levels. Study findings demonstrated that apoptosis did not occur in the control group and caspase-3 amount, which is an indicator of apoptosis, increased in IR and IR+DMSO groups. In AK295 applied group, it was observed that active caspase-3 amount was either lower or there was none when compared to ischemia induced groups. These results showed that AK295, a calpain inhibitor, partially prevented apoptosis in rats that underwent renal ischemia reperfusion. SOD catalyzes the reaction that transforms the most important among the enzymes of antioxidant enzyme system, superoxide radical into oxygen and hydrogen. Superoxide Dismutase (SOD) is a metalloenzyme [22,23]. It catalyzes the reaction of superoxide to hydrogen peroxide transformation. SOD is a defense mechanism that functions with catalase and glutathione enzyme system against the damage caused by oxygen radicals. The hydrogen peroxide that was formed is reduced to water and oxygen by catalase or glutathione peroxidase enzymes . In our study, although SOD enzyme activities increased, there was no significant difference between the control group and IR, AK295+IR and DMSO+IR groups. Especially in short duration (30 min) IR models, several studies reported that there was no increase in SOD activity, however in longer ischemia application models such as 60 and 90 min, there were significant increases in SOD activities . Thus, the duration of ischemia application seems to be significant in concretization of SOD activity. Comparison of catalase enzyme levels among the groups in our study showed that catalase levels in I/R, AK295+I/R and DMSO+I/R groups increased significantly when compared to the control group. However, comparison of ischemia reperfusion groups among themselves displayed that catalase levels in AK295+I/R and DMSO+I/R groups increased insignificantly compared to I/R group. Free radicals produced during renal I/R cause structural and functional cellular damage due to lipid peroxidation . Free oxygen radicals could not be measured since they are extremely reactive. One of the molecules used frequently as an indicator of lipid peroxidation and that gives an idea about tissue damage is MDA . In the present study, renal tissue MDA values were used as an indicator of cellular damage as well. It was observed that I/R group MDA values were significantly higher than other groups. Comparison of group MDA values showed that MDA levels increased significantly in I/R, AK295+I/R and DMSO +I/R groups when compared to the control group. Plasma creatinine formed as a result of renal function disorder, increase in urea levels is a few of the biochemical results of kidney IR damage. The increase in serum BUN level following I/R could be an indicator of kidney failure [28,29]. Findings of our study demonstrated that I/R, AK295+I/R and DMSO+I/R urea levels were significantly higher compared to the control group. This is an indicator of a disorder in kidney functions. Creatinine value is a very good indicator of diagnosis and monitoring the development of kidney failure. Creatinine is affected by glomerular filtration and it is the most practical parameter that directly reflects glomerular filtration. An increase in serum creatinine levels following IR damage indicates a function disorder in kidney proximal tubule cells . The findings of this study that I/R, AK295+I/R and DMSO +I/R values were significantly higher compared to the control group were an indication of severe kidney function disorder in the subjects. As a result, it was determined that calpain inhibitor AK295 used in renal ischemia reperfusion damage model partially inhibited apoptosis. Future in vivo and in vitro studies with AK295 could provide further knowledge on ischemiareperfusion damage that has no current treatment and it could have a place in ischemia-reperfusion damage treatment protocol. This research was supported by Inonu University with the project number of 2009/48. Akcetin Z, Busch A, Kessler G, Heynemann H, Holtz J, Bromme HJ. Evidence for only a moderate lipid peroxidation during ischemia-reperfusion of rat kidney due to its high antioxidative capacity. Urol Res 1999; 27: 280-284. Bonventre JV, Weinberg JM. Recent advances in the pathophysiology of ischemic acute renal failure. J Am Soc Nephrol 2003; 14: 2199-2210. Weinberg JM. The cell biology of ischemic renal injury. Kidney Int 1991; 39: 476-500. Nieminen AL. Apoptosis and necrosis in health and disease: role of mitochondria. Int Rev Cytol 2003; 224: 29-55. Rudiger HA, Graf R, Clavien PA. Liver ischemia: apoptosis as a central mechanism of injury. J Invest Surg 2003; 16: 149-159. Kim JS, He L, Qian T, Lemasters JJ. Role of the mitochondrial permeability transition in apoptotic and necrotic death after ischemia/reperfusion injury to hepatocytes. Curr Mol Med. 2003; 3: 527-535. Strobl S, Fernandez-Catalan C, Braun M. The crystal structure of calcium-free human m-calpain suggests an electrostatic switch mechanism for activation by calcium. Proc Natl Acad Sci USA 2000; 97: 588-592. Neffe AT, Abell AD. Developments in the design and synthesis of calpain inhibitors. Curr Opin Drug Discov Devel 2005; 8: 684-700. Saatman KE, Murai H, Bartus RT. Calpain inhibitor AK295 attenuates motor and cognitive deficits following experimental brain injury in the rat. Proc Natl Acad Sci USA 1996; 93: 3428-3433. Colak A, Kaya M, Karaoglan A. Calpain inhibitor AK 295 inhibits calpain-induced apoptosis and improves neurologic function after traumatic spinal cord injury in rats. Neurocirugia (Astur) 2009; 20: 245-254. Carragher NO. Calpain inhibition: a therapeutic strategy targeting multiple disease states. Curr Pharm Des 2006; 12: 615-638. Gonder JC, Laber K. A renewed look at laboratory rodent housing and management. ILAR J 2007; 48: 29-36. Buege JA, Aust SD. Microsomal lipid peroxidation. Methods Enzymol 1978; 52: 302-310. Luck H. Catalase. In methods of enzymatic analysis (Bergmeyer HU, Edit) Academic Press, New York, USA 1968; 885-888. McCord JM, Fridovich I. Superoxide dismutase. An enzymic function for erythrocuprein (hemocuprein). J Biol Chem 1969; 244: 6049-6055. Montalvo-Jave EE, Escalante-Tattersfield T, Ortega-Salgado JA, Pina E, Geller DA. Factors in the pathophysiology of the liver ischemia-reperfusion injury. J Surg Res 2008; 147: 153-159. Friedewald JJ, Rabb H. Inflammatory cells in ischemic acute renal failure. Kidney Int 2004; 66: 486-491. Riedl SJ, Shi Y. Molecular mechanisms of caspase regulation during apoptosis. Nat Rev Mol Cell Biol 2004; 5: 897-907. Wagner AJ, Small MB, Hay N. Myc-mediated apoptosis is blocked by ectopic expression of Bcl-2. Mol Cell Biol 1993; 13: 2432-2440. Ray SK, Hogan EL, Banik NL. Calpain in the pathophysiology of spinal cord injury: neuroprotection with calpain inhibitors. Brain Res Brain Res Rev 2003; 42: 169-185. Hong SC, Goto Y, Lanzino G, Soleau S, Kassell NF, Lee KS. Neuroprotection with a calpain inhibitor in a model of focal cerebral ischemia. Stroke 1994; 25: 663-669. Cheeseman KH, Slater TF. An introduction to free radical biochemistry. Br Med Bull 1993; 49: 481-493. Greene EL, Paller MS. Oxygen free radicals in acute renal failure. Miner Electrolyte Metab 1991; 17: 124-132. Salvemini D, Cuzzocrea S. Superoxide, superoxide dismutase and ischemic injury. Curr Opin Investig Drugs 2002; 3: 886-895. Dobashi K, Ghosh B, Orak JK, Singh I, Singh AK. Kidney ischemia-reperfusion: modulation of antioxidant defenses. Mol Cell Biochem 2000; 205: 1-11. Baud L, Ardaillou R. Involvement of reactive oxygen species in kidney damage. Br Med Bull 1993; 49: 621-629. Tasdemir C, Tasdemir S, Vardi N. Protective effect of infliximab on ischemia/reperfusion-induced damage in rat kidney. Ren Fail 2012; 34: 1144-1149. Korkmaz A, Kolankaya D. Protective effect of rutin on the ischemia/reperfusion induced damage in rat kidney. J Surg Res 2010; 164: 309-315. Tuot DS, Plantinga LC, Hsu CY. Chronic kidney disease awareness among individuals with clinical markers of kidney dysfunction. Clin J Am Soc Nephrol 2011; 6: 1838-1844. Thiemermann C, Patel NS, Kvale EO. High density lipoprotein (HDL) reduces renal ischemia/reperfusion injury. J Am Soc Nephrol 2003; 14: 1833-1843.